As a southern girl, we love our icebox desserts. Here is an easy treat to whip up and beat the heat! 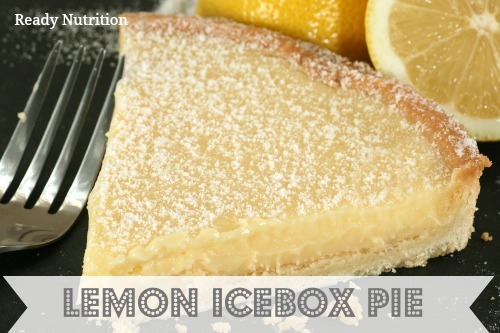 As a southern girl, we love our icebox desserts. My grandmother introduced me to these yummy desserts and I since the first time I tried them I was a forever fan. Now that I have kids of my own, life gets pretty hectic and when I want to make a dessert, I always turn to these easy icebox pies. Here’s my grandmother’s go-to dessert to make for us. For crust: Preheat oven to 325°F. While oven is heating, break the graham crackers into small pieces and place in the bowl of a food processor along with the sugar and salt. Pulse until the cracker crumbs are semi-fine and the sugar is combined. Pour in the butter and pulse until the butter is blended in and the mixture isn’t crumbly and holds its shape when you squeeze it. Transfer mixture to a pie pan and press the crumb mixture into the bottom and two-thirds of the way up the sides of the pan. Use the bottom of a measuring cup to press the crust into place. Set aside. In a mixing bowl, whisk the condensed milk with the lemon juice and set aside. Whisk the zest with the egg yolks in a medium bowl until pale, 30 to 60 seconds, and then whisk in the lemon juice-condensed milk mixture. Pour the mixture into the graham cracker pie crust, and transfer pie pan to a baking sheet and place in the oven. Bake 25 minutes or until the center jiggles slightly. Allow to cool 1 hour. Carefully cover with plastic wrap (ensuring it wrap doesn’t touch the pie) and place in the freezer for at least 6 hours or overnight. Dust with powdered sugar or top with whipped topping.